"An engaging story with varied and interesting characters that will appeal to all readers, regardless of their personal beliefs. His take on angels and demons is unique and intriguing: that they are all around us, all the time, using their influence to effect (but not control) key events in our lives. He offers a thought-provoking argument that we may not be alone here, but that our actions and choices are always ours to make. Highly recommended!" The Columbia Review. “Sanguine Rose” by Jeremiah Cross is the first installment in the “The McKarron Chronicles”— a gripping series that will fascinate any reader with an interest in the spiritual or supernatural world. 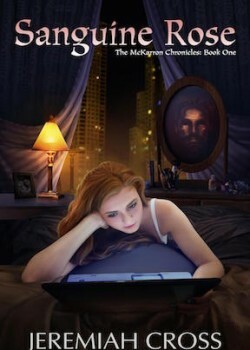 “Sanguine Rose” is a story about a young woman in her early twenties (Leslie McKarron) and her father, Stephen. Stephen had died before Leslie was born, and for all her life, she had always longed for a relationship with her father, never expecting this to actually happen. While alive, Stephen was a hitman and an overall evil person. Murder for hire wasn’t just his occupation, it was his pleasure. Until the day he followed a target into confession and shot a priest by mistake. Desperate to escape his terrible error, he reached out to the only person in the world he trusted at the time—his girlfriend, Linda McKarron. Linda’s friends thought she had it all: good looks, a great job as a nurse, and three years with a rich boyfriend she loved. All that came crashing down on the day she took Stephen’s frantic call. She rushed to his side, only to learn that their whole relationship had been built on lies. But not long after she becomes privy to this news, Linda is forced to watch him killed right in front of her, and soon thereafter she learns she is pregnant with Stephen’s baby. Armed with her faith in God, she vows to save her baby girl—Leslie—from the dark legacy of her father. After Stephen’s death, he ends up in hell—literally—where he makes a deadly deal with the demon Bathriel. He tries to escape hell by promising to ply his trade in order to bring more souls to the infernal region to take the place of his own. However, he needs his daughter Leslie’s help to succeed and chooses to approach her in attempt to get her assistance. Stephen’s request for help leaves Leslie torn between loyalty to her mother and her longing to know her father. In an epic battle spanning across this world and the next, angels and Leslie’s own hidden heavenly powers fight against demons and her father’s evil. They fight for the fate of her family and, ultimately, the spiritual balance of our world. In “Sanguine Rose”, Jeremiah Cross has succeeded in creating an engaging story with varied and interesting characters that will appeal to all readers, regardless of their personal beliefs. His take on angels and demons is unique and intriguing: that they are all around us, all the time, using their influence to effect (but not control) key events in our lives. He offers a thought-provoking argument that we may not be alone here, but that our actions and choices are always ours to make. Highly recommended!